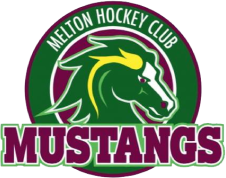 The Melton Hockey Club was formed in late 1976 as the Melton Ladies Hockey Club and the first team was entered in the North E Grade ladies competition in 1977, dressed in emerald green with royal blue skirts. The Club only had to wait a few years to gain their first premiership – that being the 1981 North D Grade ladies. A group of husbands and friends eventually convinced the Club to allow men to participate and in 1982 the name was changed to Melton Hockey Club and a men’s team was entered in the Ballarat A Grade competition. 1983 saw a second men’s team added, and Melton swept the competition in Ballarat, taking away both the A grade and B grade premierships. Seeking greater challenges, the men transferred to the Victorian Hockey Association competition in Melbourne the next year 1984. Melton’s first home games were played at the Melton Primary School where portable goals had to be erected and then put away after each game. From there the Club (still with the portable goals) moved to Macpherson Park, ‘handily’ located just five kilometres north of Melton. Many visiting teams fortunate enough to play at that venue must remember the usual bitter driving rain, and the long cold drive back to the city and perhaps because of this, Melton were awarded more than their share of forfeits over the years. Melton’s first home games were played at the Melton Primary School where portable goals had to be erected and then put away after each game. From there the Club (still with the portable goals) moved to Macpherson Park, ‘handily’ located just five kilometres north of Melton. Many visiting teams fortunate enough to play at that venue must remember the usual bitter driving rain, and the long cold drive back to the city and perhaps because of this, Melton were awarded more than their share of forfeits over the years. The grass field was replaced with an all weather sand pitch in 1987. Melton’s first junior team was entered in 1986 and since then the juniors have provided about 50% of Melton’s premiership flags. Much of the credit for this must go to Club stalwarts Earl & Sandra Morritt, who showed great ability to pass on their knowledge over many years of coaching. With the introduction of artificial surfaces, Melton teams were forced to travel to Altona to train and play, and the commitment of players during this period was commendable. Late 1995 saw the completion of Melton’s own artificial surface at Mowbray College, and in its first season 1996, the Club recorded 17 wins, 9 losses, and 4 draws on the ground. A long-standing and disappointing drought was finally broken when a Summer team brought home the first VHA pennant in the history of the Club. The 1998/99 Tuesday Footscray competition was won by Melton, with a 1-0 win in extra time over RMIT. In 2000, after many years of frugal administration the Club spent up big on improving the facilities at their ground. The addition of a cafeteria gave the club a valuable income stream and in conjunction with Mowbray College, a grant through Sport and Recreation Victoria, full lighting was finally installed. With a number of players able to boast more experience than speed, the Club took part in the 2001/02 Monday Footscray-2 Veterans competition. With a core of dedicated players, Melton participated in the 2002 West D Veterans (winning the premiership!!) and so finally managed to compete in all three competitions. Expansion of facilities at the Mowbray ground continued in 2002, with a 7 metre by 15 metre building constructed entirely from Club funding now providing the Club with a base. Known unofficially as Dave’s Shed after the former CEO at the time, David Downs, who was instrumental in the design, layout and organisation for the sheds erection. The 2006 Winter season was perhaps the most successful in the club’s history, with five premierships from the twelve teams competing. One of these was won by the Metro 3 West men – breaking a seven-game losing spree in men’s Winter grand finals. In 2007, Melton regained its State League status in fielding both Male and Female teams. Between 2007 and 2011, the Club consolidated and fielded about 130 players. During 2012, the Club found out that it was going to lose its home ground with the closure of Mowbray College. This has had an unsettlingly affect on the club regarding its status. Senior player numbers dropped away but with a revamped board and negotiation with the City of Melton and Heathdale Christian College (new owners of Mowbray), the Club continued to remain at Mowbray. The Club participated in Hockey Victoria’s 2013 restructure. With the Melton Hockey Club as one of the six Victorian clubs participating in the Women & Girls Pilot Project, this helped the Club attract a greater number of females. The Club is inclusive to all. For the first time in its history, in 2013, the Club ran an internal Hockey competition called Summer Sevens with seven teams competing. This was followed up in 2014 with both a Male and Female Summer Seven’s competition (8 teams). In 2015 the Club fielded, a Women’s Victoria League 2 team with a Reserve team and a Metro North-West B team, a Men’s Victoria League 3 team with a Reserve team and a Metro North-West B team, and a Masters 35+ team. It also fielded Junior teams in the Under 16, 14, 12 & U10 competitions, supported by the ‘Hook into Hockey’ for Under 8’s (Mini sticks) program. The Club then transferred to a new ground established at Bridge Road, Melton South by the City of Melton. This came online in April 2016, the 40th year anniversary of the Club. Funding was received from the State Government to supplement City of Melton funding to construct the Sporting Precinct at Bridge Road, Melton South, in combination with Melton Little Athletics. The Club has also played a greater role in Community development over the past 7 years, incorporating programs such as Good Sports program, Women’s Round supporting Breast Cancer research, Men’s Round supporting Prostate Cancer and Local City Council events such as ‘Get Active’ Sports Clinics and Djerriwarrh Festival. The Club currently boast to over 200 members. With a positive future, a solid administration team, low costs and excellent playing and training facilities, Melton Hockey Club aims to become a Premier Club in the outer western region.